There was a nail-biting finale to the first ever Under -13 Thai National Cricket Tournament played among 4 regional teams in Chiang Mai over the weekend. The hometown Chiang Mai team edged-out a strong team of youngsters from Khonkaen on points, to win the innaugural trophy. Chiang Mai’s extra bonus points gained for their batting and bowling in the final match of the tournament which they won against a very keen Bangkok side, were enough to see them home as under -13 champions in this historic hardball cricket event. The Khonkaen boys playing in their first competitive event were the surprise team of the tournament, winning all of their 3 matches but in the end coming second on the basis of the final points tally. Bangkok, who right up until that final game were also in the running to be champions, came in third. A gallant new team of young schoolboy cricketers from Petchabun finished in fourth place. What a weekend! The tournament was played on a round-robin basis over 2 days, with all the teams playing each other once in matches of 20-overs per side, played with only minor variations to standard cricket rules. The first game commenced at 9 AM Saturday morning, between Bangkok and Phechabun. This was watched with anxious trepidation and expectation as most of the boys had never played in a National Tournament. 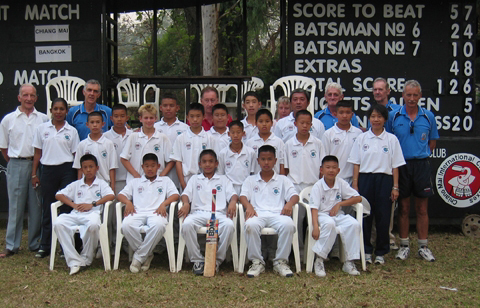 For the hosts the Chiang Mai Schools Cricket Alliance (CMSCA), this too was a completely new experience. Bangkok showed their prowess against a keen but less experienced side, winning comfortably with scores of 127 for Bangkok and 81 for Phechabun. The next game saw the unheralded team from Khonkaen play Chiang Mai. Khonkaen batted first and their adventurious batting and good running between wickets helped them to a score of 94. Then Khonkaen’s sharp fielding and accurate bowling secured the win by restricting Chiang Mai to 63 runs. The last game of the first day pitted Chiang Mai against Phechabun. The loss in their first match clearly stung the Chiang Mai boys into action. They restricted Phechabun, batting first, to a total of only 35 runs, thanks to some very tight bowling from ‘Bank’ who took five wickets and a sharp and economical spell by ‘Dan’. In their innings Chiang Mai came out blazing, ‘Poom’ scored 30 and ‘Gun’ was 31 not out at the close, with Chiang Mai scoring 150, gaining maximum bonus points and pulling themselves back into championship contention. Sunday started with Khonkaen vs Bangkok. Bangkok won the toss and batted first. They put on a respectable score of 85, with Pumpon, ‘Cha’, making 21 runs. Khonkaen then batted extremely well and although fading in the closing stages, in the second to last over, they passed Bangkok’s score with the loss of eight wickets. Khonkaen v Phechabun was up next. In Khonkaen’s innings, after losing three quick wickets they registered a solid score of 119. Phechabun’s batsmen were kept in check by some very tight bowling from Khonkaen. Although just losing 6 wickets, Petchabun were only able to accumulate 61 runs, making it an easy win for Khonkaen. The last game of the tournament pitched Bangkok against Chiang Mai. Both by this stage had accumulated equal tournament points and to overhaul Khonkaen at the top of the table a strong performance with bonus points was needed from one of them. Chiang Mai won the toss and sent Bangkok into bat. The Chiang Mai bowlers kept to a good line and length – an important quality with tournament rules awarding 2 extra runs for balls adjudged ‘wide’ by the umpires. Bangkok made an unhappy start and were 0 for 2 wickets after three overs. Although the Bangkok boys then showed better defence, wickets fell regularly and by the last over of their innings they were 55 for 9. Kurt Penny, the only international schoolboy in an otherwise all-Thai schoolboy team bowled the last over for Chiang Mai. He gave away one wide (2 runs), but captured the last Bangkok wicket on the very last ball of the innings to give his side vital bonus bowling points for taking all 10 wickets. Bangkok were all out for a modest total of 57. The Chiang Mai boys were now playing with a chance to win the tournament. They still needed not only to beat the Bangkok total, but to score at least 125 runs to gain sufficient extra batting points. Although they lost five wickets, they accumulated 126 runs in their allotted 20 overs, which was just two runs between being crowned champions and coming in second!! The level of cricket played was outstanding, bowlers bowled, both fast and slow, on a good line and length, young batsmen played with classic defensive and attacking stroke-play, and the fielding was fearless and alert, with good backing up and some exciting catches taken. All four teams were a credit to their coaches and more than justified the belief of the organisers that the sport of cricket can be played well and enjoyed by Thai children from small village schools to big city colleges. Credit must be given also to the coaches of the teams for achieving such an impressive level of genuine cricketing skill in so short a time, with their young charges — David Buck in Chiang Mai and Brian Wiggings in Bangkok (David and Brian are both professionally qualified Level 3 coaches from England and Australia respectively), as well as the two ‘inspired amateur’ coaches – a Thai lady, Jiravadee ‘Tuk’ Duangchakam coaching Petchabun and an Englishman, Eddie Joyner who began coaching the children in Khonkaen on his own initiative. In addition to the Chiang Mai team victory in the tournament, individual player recognition went as “Man of the Match” to Wonchana (Khonkaen), Khraipop (Bangkok), Sontoin (Petchabun), and Kurt Penny (ChiangMai). “Player of the Series” was awarded to Wonchana of Khonkaen. It was the most wonderful weekend with new friendships being made between children and adults from these four areas of Thailand. Setting an official seal on the event and full of praise for what had been achieved, Mr. Ravi Seghal, the Chairman of the Thailand Cricket League flew up at short notice from Bangkok to present the trophies together with Mr. Puttivat ‘Parn’ Poshyanonda, Chairman of Chiang Mai Schools Cricket Alliance. Thanks were extended to Pepsi Cola (Thailand), to Chiengmai Gymkhana Club and to the White Lotus Restaurant in Chiang Mai, for their support of the tournament. Both Ravi and Parn emphasised that this tournament, begun on the initiative of the CMSCA, must only be a beginning. More inter-region matches must be organised, and this Under-13 National Tournament should be repeated next year, perhaps in one of the other regional venues. That however, as Ravi so rightly noted, will need the development of proper grounds for playing cricket in these other regions. It is clear from this tournament, and from the strides being made in the take-up of Sawasdee (softball) cricket among younger children, that cricket as a sport can catch the imagination and interest of Thai school children and help, with other positive activities, to keep them away from drugs and other bad influences. Cricket seems infact ideally suited to Thai sporting skills, requiring not bulk and brawn, but agility, timing and good hand-eye coordination. It is also a mainly hot and dry climate sport. Adult issues like official support and good funding remain key for cricket’s development. But meanwhile, as somone in the crowd at the end of last weekend’s tournament in Chiangmai rightly observed, “the winners here are really the sport of cricket and all of the children ”.